The DIT 01 digital tank level indicator is designed for continuous level measurement in basement tanks containing fuel oil. The complete level measurement system consists of the display unit with a 4-digit LCD digital display (plus extra symbols! ), a submerged probe with an electronic measuring cell, connection cables and mounting accessories. The system is designed for fast and safe installation. * Universal application in tanks with up to 3 m in height or diameter. * No dip charts required since all standard tank shapes are stored. * Fast and safe mounting with complete installation accessories. * No external supply voltage required. * Push-to-read function for extremely long battery service life. 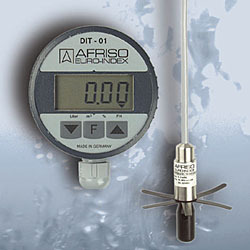 * High accuracy of measurement due to electronic sensor (pressure measuring cell). * Display unit with easy-to-read display. * Simple operation via menuguided set-up procedure. * Connection cable of the display unit can be extended by up to 10 m.
DIT 01 is suitable for use in containers and tanks with a filling level from 0.9 to 3 m. No tank chart values need to be entered since all standard tank shapes are stored in the device. Comprehensive additional liter scales are no longer required. The pressure measuring cell obtains a high measuring accuracy of +/- 1.5% FL. DIT 01 provides a menu system for maximum ease of use. The "Push-To-Read" function assures that the measured value is only displayed when it actually needs to be read, thus assuring a service life of the included 3.6 V lithium battery of approx. 5 years. Even under adverse light conditions, the 7 mm LCD display ensures that the litre or cubic meter values are easy to read. An external power supply is not required.